OMG Posters! 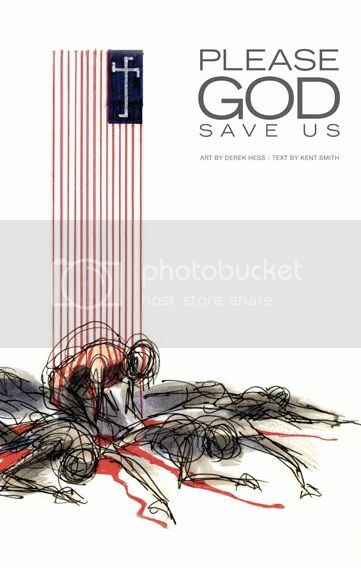 » Archive "Please God Save Us" Book by Derek Hess and Kent Smith - OMG Posters! Have some pent up anger about the Republican party? So do Kent Smith and Derek Hess, apparently. They have teamed up on a brand new book, “Please God Save Us”, with Smith ranting about right wing politics and Hess providing illustrations. You can preorder signed copies of the 112 page softcover book now. There are two packages: One with just the signed book for $25, the other includes a signed copy of the book and “Thrown” (an 18″ x 28″ offset art print with an edition of 300) for $60. Visit IndieMerchStore.com. 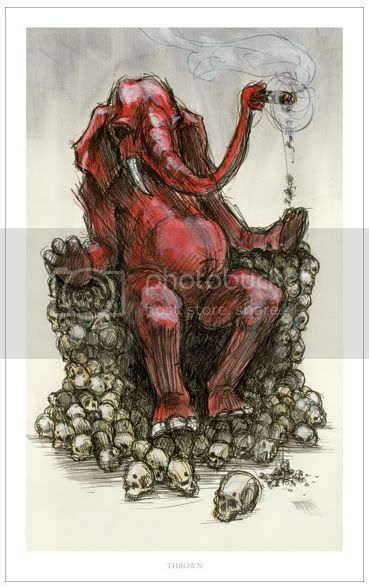 not sure why but the evil elephant on the ol throne of skulls seems likable. ya know. like it. communism maybe, but who am i to ponder these things, just a simple feller , me. Love the crucistika. Illustration aside, it’s a shame this book doesn’t sound like it’ll be a balanced argument since it was written by a Democrat politician. Which is a shame since I don’t buy books just to look at the the pictures anymore. You’re lucky you’re able to afford to buy anything after the state of political and financial demise that De Fuhrer Bush has left us all in. Remember that surplus in the nineties? Wow, isn’t this war on people great? Debt ain’t no thing. This hegemony is long gone.